Well, I brewed my third batch of the Arctic Vortex Winter Saison on New Year's Day. 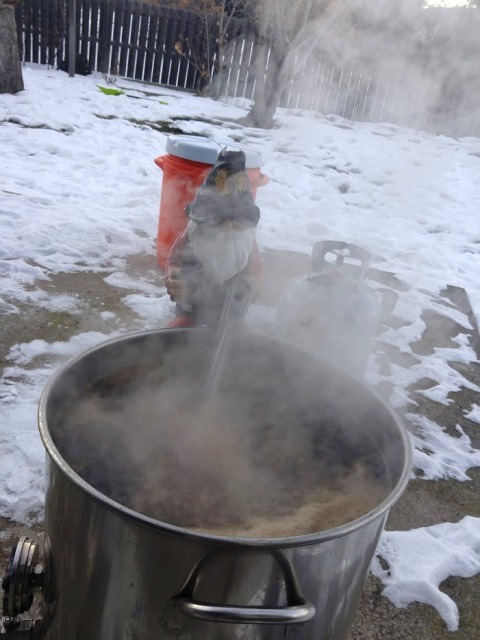 Arctic Vortex was the first of the "Seasonal Saison" series of beers I brew. 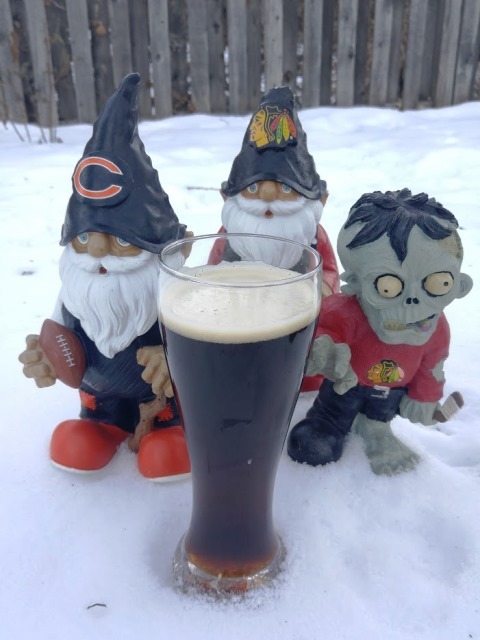 It is my "Winter Saison", and I made it a black Saison to signify longer nights in this season. When I stopped by my favorite Local Home Brew Shop, they were out of my favorite Saison Yeast. WY3711 (aka the Real Super Yeast). I asked the manager if he had anything similar. He suggested I give the INIS-291 Saison : Farmhouse yeast from Inland Island a try. He even said he'd give me two vials for the price of one. I couldn't pass on that 2 for 1 offer. Inland Island Yeast Lab is a local yeast lab. I've never used their yeast for anything before. 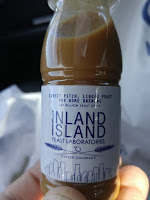 Doing some research, Inland Island does have a French Saison yeast that matches up with the 3711, but INIS-291 is not it. So, the attenuation and temperature range for the INIS-291 is not what I'm used to. Actually, fermenting that hot is sort of difficult for me. I'm used to making an effort to cool the fermentation. I've never had to worry about heating the fermentation. But, I had the yeast. I had to give it a try. 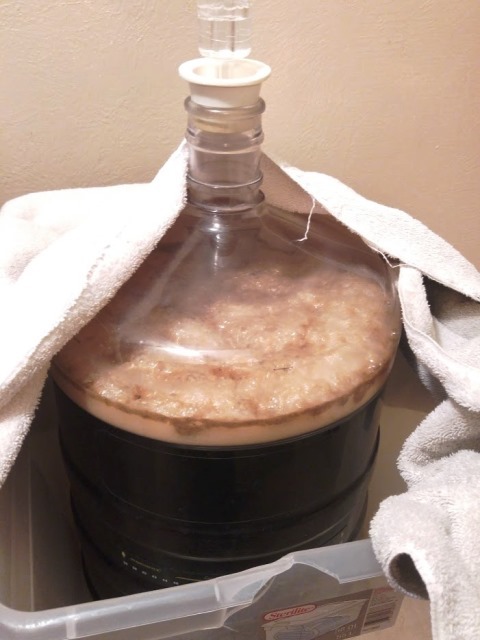 Usually, I don't even worry about a yeast starter for my "Super Yeast". WY3711 does such a good job, I find I don't generally need a starter. Even with 2 vials of the new yeast, I decided to make a starter. More yeast has a better chance of attenuating better. For the record, I tasted the resulting liquid from the starter, and it tasted fantastic. 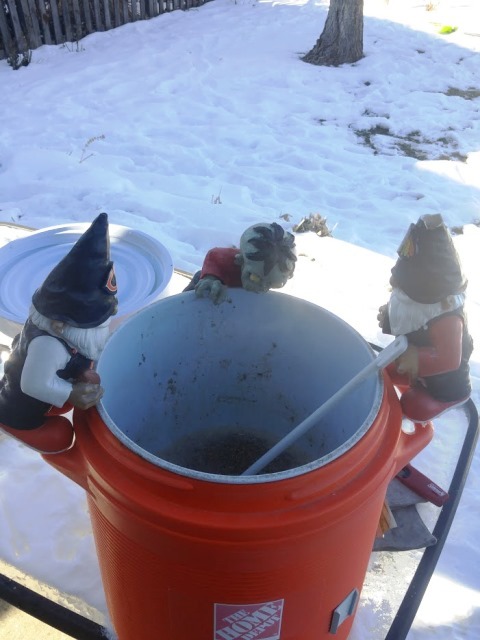 Brew day was sort of strange on New Year's day. I didn't get started until mid-morning. If you follow my brew day posts on this blog, you probably realize that I usually start my brew day before the sun comes up. My wife and kids wanted to go see a movie, so I took a pause after sparging to go to a movie. It was late afternoon before I got around to boiling. 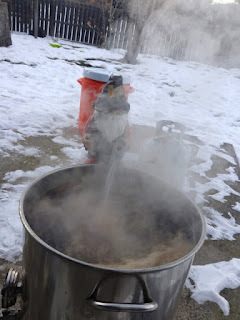 Since it was so late, I even had a beer during the boil. X-Mas Ale 2015 was delicious. And it was dark before I had the beer chilled and racked into the fermentor. Really really strange. It was sort of nice not having to chill so far down. I ended up pitching at about 68. 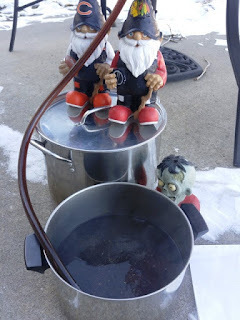 By the next morning, the yeast was chomping away, and the temperature rose to the mid-70's. The temperature of the fermentor got to 78 on day 3, which is as high as my temperature strip measures. 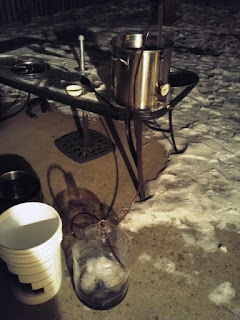 I've been using a space heater at night to keep the temperature of the fermentation room up. The initial "hot and heavy" fermentation is about done now. I will probably take a gravity reading soon to see what sort of attenuation I achieved. For updates, Keep an eye on all the regular spots: SheppyBrew's Facebook Page; Sheppy's Twitter Feed; and SheppyBrew's Website. I'll be sure to post something there telling you how it turns out. Who knows ... maybe I have discovered my new "Super Yeast".